Beverly - Vito “Chick” Bucco 84, beloved husband of Janice A. (Damiani) Bucco, died Monday, April 08, 2019 at the Kaplan Family Hospice House in Danvers, surrounded by his family. Born and raised in Ortona, Italy, he was the son of the late Mauro and Anita (Bartera) Bucco. He immigrated to this country in 1950, settling in Beverly and attended the Beverly school system. Mr. Bucco owned and operated Vito Bucco & Sons Plastering Inc. in Beverly. A longtime resident of Beverly, Chick, was a member of the Bricklayers and Allied Craftsman Union Local #3, a member of the Poultry Committee of the Topsfield Fair, an Honorary member of the Vittori-Rocci Post and a longtime member of the Patria e Lavoro Society in Beverly. He was a loving husband, father, grandfather, brother, uncle and friend who will be missed by all who knew him. 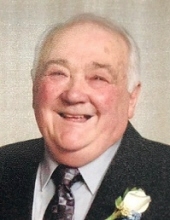 His funeral Mass will be celebrated at St. Mary Star of the Sea Church, 253 Cabot Street, Beverly, Saturday, April 13, 2019 at 10:00 a.m. Relatives and friends are invited to attend. Visiting hours at the Campbell Funeral Home, 525 Cabot Street, Beverly, Friday from 3:00 to 7:00 p.m. Burial in St. Mary’s Cemetery, Beverly. Contributions may be made in his memory to the Zachary Mauro Crawford Tribute Fund online at http://DanaFarber.JimmyFund.org/goto/TracksForZack or Checks by mail to: BMJFW Attn: Alexa Ramer 10 Brookline Place 6th Floor Brookline, MA 02445. Information, directions, condolences at www.campbellfuneral.com . To send flowers or a remembrance gift to the family of Vito Bucco, please visit our Tribute Store. "Email Address" would like to share the life celebration of Vito Bucco. Click on the "link" to go to share a favorite memory or leave a condolence message for the family.